When you think about those two words, an image of something cute pops into your mind. Like maybe a cute version of Viktor Nikiforov from Yuri On Ice. Or how about Aqua from Kono Suba? If that’s true, then as an anime collector you might have wondered – what’s the history of Nendoroid figures? How did they even start? Why are they called Nendoroid’s and how did the idea come to fruition? Turns out there aren’t that many Anime sites online who go into the history of Nendoroid’s. As an Anime retailer, it’s Anime Motivation’s job to educate Anime fans/collectors across the world. And so here we are – diving into the details of how Nendoroid figures started, and what the history is behind them. So let’s get straight to it. Hopefully you’ll find this article valuable and educational. The year of the Nendoroid first began back in 2006. 11 years ago today. 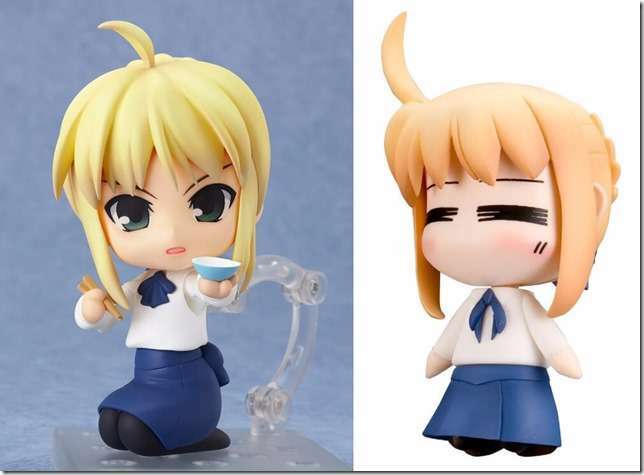 And the first ever manufactured Nendoroid was Nendoroid Neko Arc from the video game – Tsukihime. Tsukihime is a video game created online for Windows computers. The company behind the game is Type-Moon. The same company behind the Fate Stay Night series (and many others). This first ever Nendoroid figure was officially licensed and manufactured by the Good Smile Company (pictured above). And was released during the Tokyo Wonder Festival in 2006. A festival that takes place in the months – February and August promoting garage kits and sculptures. The original creator of the Nendoroid series is a man named Tsuyoshi Oda. The Good Smile Company and Nendoroid creators worked hard for over 3 years before anything major happened. Producing all types of Nendoroid figures from Anime’s like Fate Stay Night and Shakugan No Shana. Then by 2009, Nendoroid figures became so successful that they had sold over 1 million units. And the Nendoroid Petite figures (a different version) sold over 3 million in total. After hitting such a massive milestone the Nendoroid series expanded. Putting the total number of Nendoroid figures at 100 by 2010. The Good Smile Company followed up their success by hitting a new milestone of 300 products by 2013. And of course as you can imagine, bootleg Nendoroid figurines started to show up all over the place. Because Nendoroid’s as a series became so successful, counterfeit sellers wanted a piece of the action. The first Nendoroid figure looked like this (Nendoroid Neko Arc Figure). From 2006 onwards, Nendoroid creators came up with a design of Rider, from Fate Stay Night. This is how Riders Nendoroid figure looked in the beginning. Compare that to how well-designed Riders Nendoroid figure is today (picture below). The difference is pretty magical, right? The two designs are incomparable. Not just in quality, but in how realistic the figure looks compared to the real anime character. Here are some more side-by-side comparisons of old vs new Nendoroid designs. You can tell which Nendoroid is more modern by looking at the images above. And it goes to show just far Good Smile Company (and other Nendoroid creators) have come. And how much effort they’ve put into making the designs more attractive and realistic over the years. The Good Smile Company is synonymous with Nendoroid figures. It’s not an exaggeration to say if it weren’t for the Good Smile Company, Nendoroid figures wouldn’t exist. And the market wouldn’t have gained so much traction and popularity worldwide. But there are other creators of Nendoroid figures too. Some of who started out not long after Good Smile began. And companies along those lines. But Good Smile is the biggest Japanese manufacturer of Nendoroid figures. And is likely the creator behind the majority of Nendoroid figures you’re interested in buying. These days Nendoroid figures come with all kinds of action poses, facial expressions and face plates. Included right out of the box of many Nendoroid figure releases and Good Smile products. It took 11 years for Nendoroid figures to get to this point when it comes to quality. One thing’s for sure: as technology and innovations speed up, the designs of Nendoroid figures will improve. Who knows – maybe Nendoroid’s will have AI features at some point (artificial intelligence). Or some other function that helps you connect to your favourite anime characters on a deeper level. When that time comes – Anime Motivation will be here to serve it to the Anime community. And that’s about everything there is to know about the history of Nendoroid figures. If anymore information is out there, this post will be updated to give you more insight!